Ahmedabad University, University Office, Ahmedabad University, Commerce Six Roads, Navrangpura, Ahmedabad, Ahmedabad, India 380009. 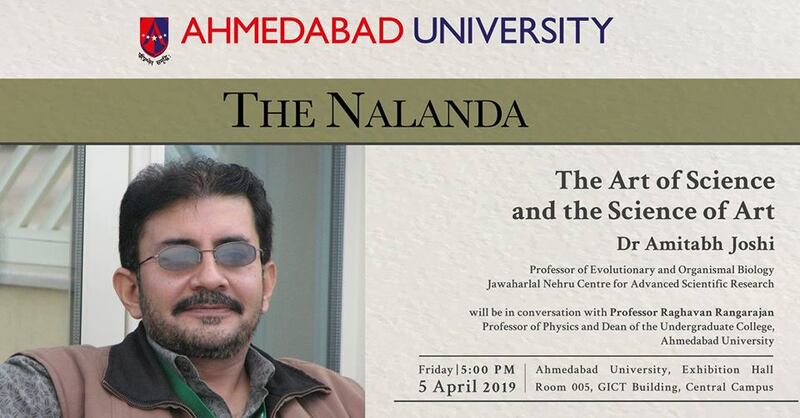 At the next session of The Nalanda on 5 April, Professor Amitabh Joshi (Professor of Evolutionary and Organismal Biology, Jawaharlal Nehru Centre for Advanced Scientific Research) will be in conversation with Professor Raghavan Rangarajan (Professor of Physics and Dean of the Undergraduate College, Ahmedabad University) on ‘The Art of Science and the Science of Art’. This session is being specially organised for students and faculty and staff members at Ahmedabad University.